Despite all of the intricacies with weight loss and dieting, there are a variety of fat-burning spices that aid in achieving weight loss and also help in maintaining one’s target weight. A weight loss program typically involves the avoidance of certain foods that contain fats, consuming foods that are rich in fiber, and following an exercise regimen. This would translate as incorporating more vegetables, fruits, and whole grains into one’s diet. A disciplined approach and a focused mind can usually help one make prudent progress and achieve one’s goals. Conversely, how does one discern between several fruits and vegetables when it comes to reducing obesity or achieving weight loss? How does one know which plant or herb can increase body metabolism or reduce your appetite? What foods specifically help one keep and maintain a healthy body weight once goals have been reached? Despite all of the intricacies with weight loss and dieting, there are a variety of fat-burning spices that aid in achieving weight loss and also help in maintaining one’s target weight. Black pepper is a creeper or climber and is native to India. The seeds of black pepper, known as peppercorns, are commonly used in many culinary preparations across the world. Research conducted in Seoul, South Korea, at Sejong University, has opined that piperine (an alkaloid) found in black pepper prevents the formation of fat cells. Ginger comes from the roots of the Zingiber plant, and it is mostly used as a spice in food preparations, but has various medicinal values. Apart from aiding in weight loss, ginger can serve as a detoxifying cleanser and help stop nausea and vomiting. Ginger is a proven natural appetite suppressant, which causes a person to feel ‘full’ after the intake of only small quantities of food. Cinnamon forms the inner layer of bark of some trees belonging to the genus Cinnamomum. Cinnamon is beneficial to diabetics and helps control blood sugar. It is also a weight-reducer and can help keep your body thin. Research at the Human Nutrition Research Center at the United States Department of Agriculture, which is published in the Journal of Agricultural and Food Chemistry, showed that adding cinnamon to foods can increase sugar metabolism rates by up to 20-times. However, when it is used to reduce weight, cinnamon must be taken judiciously, for it can lead to liver damage. The seeds of the mustard plant are used as a spice across the world. It has a low-calorie content and can help burn fat in the body. A study by England’s Oxford Polytechnic Institute informs that ingesting a teaspoon of mustard can increase one’s body metabolism rates by over 20% for a few hours after consumption. Cumin ‘seed’ is the dried fruit of a plant that belongs to the parsley family. Cumin works in the body by enhancing the digestive system process, efficiently absorbing all the vital nutrients, and getting rid of wastes. Due to this, there is no buildup of fat storage in the body. 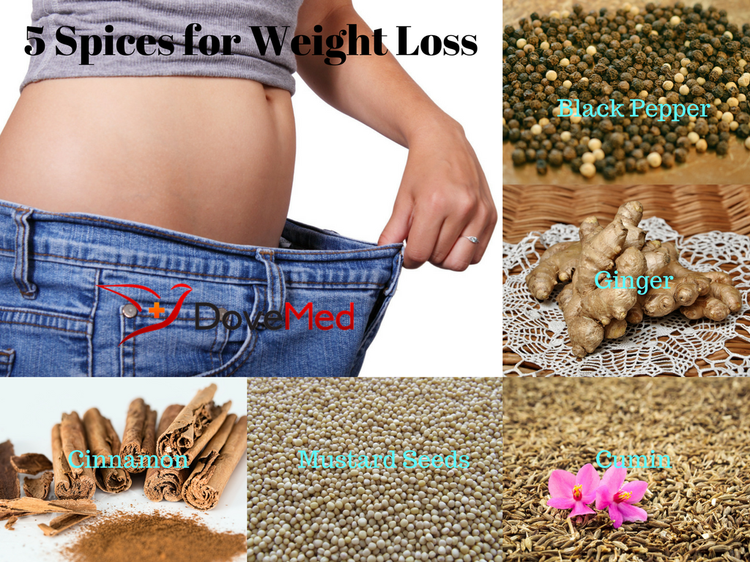 These various ‘weight loss’ herbs can be incorporated into your everyday diet as natural supplements for weight loss and healthy weight maintenance. However, it is advised to talk to your healthcare provider before making significant alterations to your diet for your weight loss goals. Metabolic effects of spices, teas, and caffeine. Westerterp-Plantenga M, Diepvens K, Joosen AM, Bérubé-Parent S, Tremblay A. Physiol Behav. 2006 Aug 30; 89(1):85-91. Epub 2006 Mar 30. Biochemical Pharmacology December 1, 2012; 84(11):1501-10. Obesity and thermogenesis related to the consumption of caffeine, ephedrine, capsaicin, and green tea. Diepvens K, Westerterp KR, Westerterp-Plantenga MS. Am J Physiol Regul Integr Comp Physiol. 2007 Jan; 292(1):R77-85. Epub 2006 Jul 13. Westerterp-Plantenga, M., Diepvens, K., Joosen, A. M., Bérubé-Parent, S., & Tremblay, A. (2006). Metabolic effects of spices, teas, and caffeine. Physiology & Behavior, 89(1), 85-91. Papadaki, A., Linardakis, M., Plada, M., Larsen, T. M., Van-Baak, M. A., Lindroos, A. K., ... & Holst, C. (2013). A multicentre weight loss study using a low-calorie diet over 8 weeks: regional differences in efficacy across eight European cities. Mattes, R. D. (2012). Spices and energy balance. Physiology & behavior, 107(4), 584-590. Kelble, A. (2005). Spices and type 2 diabetes. Nutrition & Food Science, 35(2), 81-87.